Showing results for tags 'kayak'. I get that kayak maintenance is important. I own a Hobie Revolution 13 which gets a wipe down every time it comes home. I service the mirage drive once a year at home including a grease change. After walking past a marina this afternoon I think my maintenance program is a little inadequate compared to whoever owns the kayak in the photo... I would have never thought of booking a slipway for an annual kayak service. whats the best burley i can purchase? Good Fishing spots at Copeton Dam? Hey fellow raiders, I will be heading up to copeton soon and i was wondering if anyone has any spots in the dam they recommend to fish for cod and what lures I should use. Cheers Hamo? Anyone here tried or use a live bait tube / torpedo? particularly: how big do they need to be? for yakkas? do they keep squid alive? even when towed? and, any suggestions on easy way to streamline them? I went out for a kayak session yesterday as I had not done that for a while and it was a lovely day. My plan was simple - drift along the edge of a sandbank and work the top of the bank with soft plastics, while dragging a bait along the bottom from one of the rod holders just over the drop-off. That was the theory anyway. Even though on the shore there seemed to be almost no wind there was a very inconvenient breeze out on the water that was pushing me up over the top of the still submerged sandbank. This would not be the end of the world, but with the swell coming in the heads and boat wakes coming from all angles going over the edge of the sandbank was not a great place to be as it was very washy and the angles the wave were coming form were very hard to predict. I did get a solid hit on the soft plastic right up on top of the bank but it didn't hook up. After a while and not much activity I decided to reposition into some deeper water that I thought would be a bit more out of the wind. I put away the SP rod and worked a prawn along the bottom. I still had a the other bait rod out the back as well with a whole pillie on a gang and enough of a sinker to keep it down the bottom on the drift. The prawn started to get hits straight away. A couple of the bites were fairly aggressive and were probably small flatties, but more often it was the rat-a-tat-tat bites of the small bream picking my prawns off. I was rebaiting that rod again when the big one bent over and started pulling line. My first thought was it was snagged and the current was pulling the line out because it was not screaming, just coming off in a steady pull. Once I managed get it out of the rod holder I did a big lift and was surprised to feel something come up off the bottom. There was no fight, no tail beat, no headshakes. At this stage I am thinking I have either snagged something like a waterlogged branch that is moving when I lift or a big stingray - as they are often around in Ettalong Channel. We'll never no because the next lift the line relaxed and I wound in to find my gang still there, but the pillie gone. I repositioned for another drift over the same patch and rebaited with a fresh pillie. This was hit fairly quickly and it felt like the target species, though I could tell it was no monster. I got it up and confirmed that it was a little flattie - clearly undersized at about 33cm. This is the point I made a decision that provided much amusement to the tinnie full of teens that was about 10m away when I got the fish to the surface. Seeing it was just a little tacker I did what I would do when fishing from the boat. I didn't bother with the net, I just lifted it in to unhook it. The problem was that as soon as it hit the deck between my legs, it spat the hooks and tried to escape. I just could not get a grip on the little bugger and with no net and no line attached to his lip I certainly was not the one in control of the situation! He flopped over my right leg and made a dash towards my foot. I tried to grab him, he spiked me and reversed direction and wiggled all the way along my leg and retreated behind the seat. Not wanting to hurt him I lift my bum up and grab him. He spikes me again and shimmies all the way down my other leg right up to the hatch on the front of the yak. Finally he opens his mouth! I stick my thumb in and lip grip him. Now that I have him I measure him and confirm he's undersized (was bang on my guess at 33cm) and let him go. One of the kids in the tinnie says something like "whoa what a monster". His mate says "shut up - he's caught more than us". I just smiled. The humble flathead never ceases to amaze me. 33cm fish taking a whole pillie that must be about 1/3 of its body length. These guys can eat. I continued for a while longer and managed to land one more fish that was slightly better, but not good enough. I netted this one which was SO much easier to deal with, did a quick measure - 35cm. The current was really starting to run now and I had drifted fair way from the beach I launched from. It was a fair slog back against the current - hence the sore shoulders today! Frustrating to not get a feed but it was - as always - great to be out on the water and I'll take catching small fish over no fish any day. Recommend a car to transport a kayak? going out in the yak tomorrow anyone keen to tag along? And so it begins Raiders, I get a Kayak, She wants a kayak. I go fishing, she comes and now wants rod holders. Can see ill be pimping up my 9 year olds Kids kayak for the next few weeks. Well at least is a healthy way to get out of the house. Mark. Hello Raiders, As you know I've only had a Kayak for 3 weeks. I'm loving it but would like to ask who uses an anchor and what type, or on the other hand why don't you. Been looking into it so any input would be awesome. Cheers Mark. Hello Raiders, Finally got around to getting a yak. Not an expensive one but it was cracking fun today. Did the first test trip today and loaded it up and went for a paddle with my 9yo daughter. Managed all my kit, 3 rods, a net, water, food, tackle and a buckets etc etc. Cant wait to get out there again and throw a few lures and SP's around. Mark. Lake Glenbawn: Trailerboat or Kayak? Hi guys just thought I'd post something to share. Went to a friend's house to test out the kayak ive just bought. The RTM Tempo. Since reading about how its a little tippy i thought of testing it out in sheltered water. It's summer in the UAE now and temps could reach as high up as the lower 50s in really warm days. Last friday was around 47/48C. I launched from one of the fronds of Palm Jumeriah. One of the Palm islands of Dubai. my launch point was the second frond To the right. I paddled for about 30 minutes to get to know how she rode before heading back, as I went past the tram rails and noticed some activity near the pylons This prompted me to paddle faster, as i was making my way to th car the water around me erupted with baitfish and a school of hungry queenfish chasing the tiny sardines that seeked cover from the moving yak. As soon as i got to shore i ran up to the car and hurriedly assembled my rod and reel. I chose to go with a tai rubber rod a round baitcaster that matched it and small slow jigs to round out the arsenal. I took a few spares with me and off i went. I wanted to go back to the pylons and drop a few jigs to see if there were some golden trevallies around. These fish are great fighters on light tackle and are quite abundant in the summer months. So off i went. As soon as i got the the middle pylon i dropped my 20g storm koika to the side and almost immediately a queenfish took the lure and started jumping. It was not the monster i hoped for but in this kind of weather, you are thankful to at least hook something. The second drop was a bit better with a good bite just off the bottom and i got rewarded with a small orange spot grouper. The third drop was quite far from the pylon as i drifted downstream a bit because of the incoming tide. Me being me, i was just too tired to paddle upstream. As expected the bites that came so sudden came to a very painful stop (sweltering to be exact). I paddled and positioned myself near the 4th pylon and looked at the jig while it was falling. As expected the flutter of these koika jigs are so enticing but more than that i was extremely surprised at how the tai rubber rod was perfect for shallow slow jigging applications. The solid tip gave the jig a nice bounce! When the jig reached the bottom, i immediately started the slow jigging motion. Before i could quarter turn my handle the rod buckled over and the drag started to scream. The combo is quite light, loaded with PE.4 the sound of the click alarm from the shimano conquest was enough to get the attention of the sunbathers on the beach. When The fish started pulling me cheers erupted - half of them might have expected a shark! At one point 3/4 of the rod was in the water because the fish went under the boat - to make matters worse the security boat was inching it's way towards me - residents and guests are allowed to fish with non motorized boats but for obvious reasons, they are very careful when it comes to boats that go too close to the pylons. I caught a lucky break when the then unidentified fish decided to go to shallower water. The thin solid tip of the rod was still in the water while i try my hardest to pull the fish. As soon as i managed to get hold of the leader, i slowly pulled the fish towards me - it was then I realized that the fish was a goldy. Not wanting to jinx myself i immediately paddled towards the car. Reaching shore i asked my cousin to take a picture of the fish - my first fish using the kayak, after a few snaps we sent him on his way. The fish was not massive , but it was a great reward after slowly roasting in the summer sun. 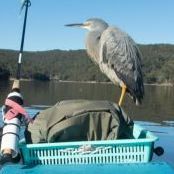 Port Hacking - Nice by-catch! Hey Raiders, I hope you're all having a good weekend and managing some time out, on or near the water! Friday the 13th turned out to be lucky for me! I decided to head out on the kayak, launching from Gray's Point and heading downstream. I usually drift along the river here and pick up flatties and bream with the odd whiting thrown in. This day I wanted to head up around the corner to the deeper water between Gymea and Yowie bays. I've caught a kingfish there before and I wanted to try jigging for them again. There wasn't much action on the paddle along so decided to head straight for the area in about 16m of water. Got to my place and put a SP jig over the side to work its magic. Thought I might snag a snapper whilst I was there so lobbed a prawn over the other side on the light tackle rod, with 2500 baitrunner reel and sat back to enjoy the beautiful day. Sunshine, blue skies and no wind. After about 10 minutes the baitrunner has a touch and a bit of line is taken. Then a bit more. Then its off like mad! Kingy I thought and started to panic as its 4lb braid and 8lb fc leader. Take it easy I tell myself and don't fight it too hard. As I'm thinking all this and trying to stay calm the fish is getting tangled up in the SP line over the other side so I'm having to try and untangle and fight the fish at the same time, not easy in a kayak! Decided to chance it and put the rod in the holder while I untangled and prayed that it wouldn't get loose and spit the hook. Working as fast as I could I managed to untangle and bring in the SP line. Now, back to the fight. There was some decent weight in the fish and it started to slow and I was able to bring back some line. A few more half-hearted runs and I could see colour at last. Its length was good and nice a sliver and I was thinking "kingy"! But as it came up and then hit the surface I couldn't believe it - a jewie! Nice big, fat jewfish flapping on the surface. Cleared the decks on the kayak and out came the lip grips and brought it over the side. A quick measure and I reckon it was around 72cm, a PB for me and a legal fish! I had no ice, a small esky and so, after a few snaps, decided to let the lovely fish go and fight another day. A fantastic, lucky by-catch and had me smiling for the rest of the afternoon! Hi all, Been a long time reader – finally caught something of note to put a report up! I managed to get up to Boomerang beach on the weekend with the gf with the view of getting in a quick kayak fish to try and catch one of the large kingies/cobia/longtail I hear are about this time of year. With still seas/wind I managed to launch the kayak at around 4pm Saturday and paddled to a reef off one of the headlands where I could catch a few livebait. I started burleying and as soon as the bread touched the water there was a whole school of fish below my kayak. I managed 3 yakkas in quick succession then got a nice slimy which was pinned straight through the nose and thrown behind the kayak. Not wanting too many livebait (only a bucket with no aerator) I started my paddle around the headland. There were many LBG fisherman on the rocks and I made sure I gave them and their balloons/floats a wide berth. After passing the LBG guys I was able to come in closer to the rocks where after a short while I sounded a big ball of bait which looked to be harassed by something. I looked with anticipation as the slimy started darting around then nothing, I reeled the line in and he had managed to get off. I quickly pinned a yakka through the nose and paddled back to where the bait ball was. On dropping the yakka down he quickly started to bounce around evading something. I thought to myself that I had to be in with a chance here when I feel weight on the rod and that great sound zzzzz. This thing took off quickly and was towing me straight to the rocks making me nervous I was getting too close to the wash. At this point I thought it was a kingy trying to take me straight into structure so I started palming the spool lightly, when it did a 180 turn and headed out to sea at speed staying up high. After two or three long runs it must have taken over 100 metres of line out and was dragging my kayak further and further out (later looking at my sounder it was only 400 metres or so – felt a lot further at the time!). I was slowly getting line back and after another 20-25 minutes minutes and a lot of circling (doing its best to try tip me out) I had it next to the kayak. Without a net or gaff I had no idea how to get it in, I couldn’t reach down and grab its tail so I started trying to lip grip it, grab its fins etc which was to no avail. I started leaning over further careful to not flip the kayak and after what would have been 10 attempts I finally managed to grab its tail and swung it into the kayak. I was absolutely over the moon in shock that I had actually caught a longtail (I didn’t really believe I had a chance!). Now began the nervous long paddle back with the kayak a lot closer to the waterline than before. After getting home exhausted and excited I measured it and it went 111cm to the tip – does anyone have an idea how heavy that would be? I was thinking 20kg+ as it was pretty hard to hold up for the photo! Sorry for no pictures out on the water – I didn’t have a camera until I got home. Could I please enter this into the April catch of the month? Thanks for reading! Mike edit: Mods/admin could you please resize the pictures appropriately? They seem to be coming out tiny on my computer. Hi folks, It has been an eternity since my last post, but here it is. I finally landed a few bream on a hard body lure. I decided that I had enough of reading posts and magazine articles depicting small lures hanging out of the gobs of monstrous blue nosed bream. It was time I got one for myself. I did a bit of a search and purchased a few breamy looking lures. The next day I was geared for war and with my new collection of bream lures I set off in search of old blue nose. Sitting in my kayak, drifting slowly, I cast towards every bit of shade I could find. After two hours with no luck, I cast perfectly under a huge over hanging tree. All the casting practice with small lures had finally paid off, I started to slowly wind in when I felt a few nudges. A well undersized bream took the little river2sea lure, It was not much but made me smile. To my surprise another bream was sitting in the same bit of shade, he was fairly small also but for me this was a massive win. After no more hits in that area I moved underneath a bridge and cast towards all the pylons. Boom got a hit as soon as my lure landed. The fish swam underneath the Kayak but always seemed to be on the surface. Eventually brought in the little taylor, wishing it was another bream. Just before I called it quits I decided to have a few casts along a weed bed, the current and wind pushed my kayak towards every unwanted angle. I was just about to straighten up my kayak ready to move and my drag started to run a bit. Winding up I felt the kicks of a still small but slightly bigger bream. Was so thrilled about it that I managed to take a pic of him from my phone. It's not much to look at but made my trip worth it. Thanks for reading. Reeseman. My collection of new bream lures. Just a small one but was plenty of fun.